Great for larger containers, the lovely scent of the Jasmine flower is best enjoyed near an outdoor sitting area. Plant in a warm sheltered location and mulch the soil to conserve moisture. If growing in a pot, make sure it has good drainage. Prune after flowering and bring indoors before temperatures drop below 40°F to overwinter in a sunny enclosed porch or south-facing window where it won't get too warm. It may lose some of its leaves, but not to worry-it will grow new ones come springtime. Set back outside once temperatures remain above 40°F. Watering Details: About 1" per week. Keep moist, but not soggy. Fertilizer: Scratch in a couple of inches of compost prior to planting or potting up. Feed monthly with a water-soluble, organically sourced fertilizer, or scratch in a granular fertilizer. Plant: Twining vines with ovate, deep green leaves. Flowering: Shell-pink sweetly fragrant flowers. 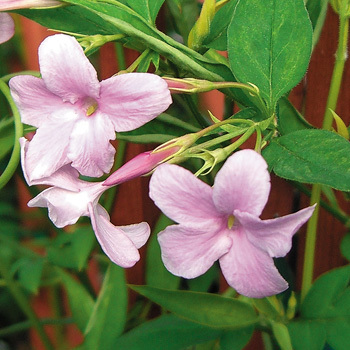 Jasmine 'Stephanense' was hybridized in France from two plants native to China: Jasminum beesianum and Jasminum officinale.